Well, I think that’s the big question. To what degree will this rally the base. The question is ‘what will this decision do to the conservative movement today’? Clearly, it will rally some TEA Partiers but I think we have to keep a close watch on the intensity of that rally. Well, the congressional elections of 2012, each member will be fighting for his or her own seat and we’re already seeing some glimpses of this. Democrats not going to the Democratic National Convention, they’re looking out for themselves first. We’ll see the same thing from Republicans as well. But Republicans are saying ‘Just give us a Republican president and a Republican congress’ but it isn’t that easy. One of the dangers of that message is that it moves away from the economy because the economy is the #1 issue in the election. First, this will be another wave election. This won’t end well for Democrats. The ACA ruling just intensifies the disgust for the ACA amongst TEA Party activists, independents and establishment Republicans. Second, while we see proof that Democrats aren’t attending the Democratic National Convention, there’s no proof that Republican legislators and candidates will stay away from Tampa. That’s because Republicans, while many of us aren’t thrilled with Mitt, won’t treat him like toxic waste. Democrats like Joe Manchin and Claire McCaskill are treating President Obama like toxic waste. Anyone who didn’t notice that shouldn’t be a political science teacher at a major university. Third, while it’s true that the economy, specifically creating jobs and growing the economy, is a high priority, it’s equally true that the ACA has jumped up to being Issue 1A to the economy’s status as Issue 1. I hope Mitt and congressional Republicans put out an alternative plan. That said, I don’t think it’s that important to offer an alternative plan at this point. Most people’s first priority after Thursday’s ruling is ridding ourselves of the ACA albatross. This becomes a problem for Romney. How does he play this issue and I’m not sure he has alot of maneuver room on this one. First, the fact that Mitt raised $5,000,000 in the 36 hours after the ruling should be more than an indicator to these geniuses that the base, and many independents, are steadfastly behind Mitt, especially since most of these contributions a) came through the internet and b) were small-dollar amount contributions. Second, Mitt Romney has said repeatedly that he’ll repeal the ACA. Yesterday, Sen. Mitch McConnell said that he’d “repeal Obamacare” if he was the majority leader and Mitt was President. He didn’t say that repeal would be a priority. Mitch didn’t say that they’d work on it. Mitch McConnell said that they’d repeal it. Think of this as Mitt Romney’s and Mitch McConnell’s equivalent of Bush 41’s Read my lips moment. If they don’t repeal the ACA, history will record them as political failures. Their legacies will be tarnished. A strong majority of the American people want the ACA repealed. That hasn’t changed since President Obama signed the bill into law. It’s consistently been that 55% of the people want the bill repealed. It’s consistently been that 40% of the people want it kept in place. This will affect women’s reaction to the Obama administration. The townhall meetings of August, 2009 featured women who said that they’d never paid attention to politics before. That was the unofficial ‘birthplace’ of Sarah Palin’s Momma Grizzlies. Health care reform awakened a sleeping giant. Most of the people in that sleeping giant were women that worried government-run health care would cost more while delivering lower quality care, which it will do. Later in the roundtable, these ‘geniuses’ said that President Obama had to do a better job defending the ACA. That’s impossible. It’s impossible to defend the indefensible. It’s impossible to defend the 21-tax salute Congress and President Obama gave to the American people. It’s impossible to defend the massive growth in the federal government. The problem isn’t that President Obama hasn’t done a good job selling the ACA. It’s that the ACA is a crappy product that a) the American people have rejected, b) was shoved down America’s throat despite the many monstrous TEA Party rallies and c) overpromises and underdelivers. People will lose their health care plan because employers will drop people and pay the fine rather than continue covering their employees. Health insurance premiums will continue rising faster than the rate of inflation. The first 50 hours after the ACA ruling shows that the intense opposition to the ACA hasn’t diminished since August, 2009. That’s a major problem for President Obama, Democrats running for re-election to the Senate and for House Democrats. Prior to Thursday’s ruling, I’d said that I was confident Mitt Romney would defeat President Obama, partly because Democrats aren’t thrilled with him. Remember the convicted felon getting 42% of the vote in West Virginia? I do. Remember Undecided getting 41% of the vote in Kentucky? I certainly do. Each election has 2 tracks in terms of polling. Daily tracking polls will reflect the blips covered during the news cycle. The weekly polling, however, shows the undercurrent that determines elections. People are frightened about the economy, the exploding national debt and dealing with the ACA. That’s what these political science professors missed entirely. They don’t have a clue about what’s happening this election. Obama Truth Team: Separating ACA truth from fiction? The facts: President Obama has cut taxes by $3,600 for the average middle-class family over the last three years, and the Republicans fought him nearly every step of the way. From cutting taxes for every working American through the Making Work Pay and payroll tax cuts to the American Opportunity Tax Credit, a tax credit worth up to $10,000 to help families pay for four years of college, the President has put more money in the pockets of middle-class Americans. The facts: This is one of the most dishonest claims in American politics. First, this isn’t about government. Obamacare builds on and improves the nation’s private health care system. Second, here’s what it fixes. Before Obamacare, insurance companies had free rein to arbitrarily cap and cancel coverage, and they could waste our premiums on overheads and big bonuses for CEOs. With Obamacare, there will now be clear rules of the road to give patients and doctors more control over health care. These rules will make sure that you and your doctor, not your insurance company, and certainly not a Washington bureaucrat, have control over your health. So much for the ACA not growing government. President Obama’s “Truth Team” is apparently quite adept at telling whoppers. That’s about all that they’re good at, IMHO. Senate Minority Leader Mitch McConnell (R-Ky.) declared Friday that repealing the health care law would top his priority list if he controls the chamber come 2013. “If [Mitt] Romney is in the White House and I am the majority leader of the Senate, I assure you repeal of Obamacare is the first item on the agenda,” McConnell on Laura Ingraham’s radio show Friday. By using a budget process called reconciliation, a theoretical Senate GOP majority could successfully vote to repeal the law with just 51 votes, rather than a filibuster-proof 60. Republicans need to pick up four seats to win control of the Senate, or three if Romney wins the White House. Reconciliation is what Democrats used to pass the ACA. It’d be poetic justice to see Republicans use reconciliation to repeal the ACA. The minute the ACA is repealed, Republicans must start hearings on replacing the ACA. Those hearings must include debate on how to contain costs, something that the ACA isn’t able to do. These hearings must also improve accessability to and portability of health insurance. Eliminating the law that says you can’t buy health insurance across state lines would be a major help. Having state legislatures pass laws that limit the number of mandates would make it easier for consumers to buy competitively priced policies from other states’ insurance companies. Another option is having governors sign compacts with other states that allows for the purchase of health insurance is another way of getting around legislatures passing health insurance reform. There’s been a total sea change since the SCOTUS ruling. While I’m not thrilled with Chief Justice Roberts’ ruling, I’m thrilled at conservatives’ and TEA Party activists’ reaction to it. I told a friend earlier today (or perhaps it was last night? ), Chief Justice Roberts’ ruling essentially eliminated all of the public’s apathy on this subject. People are fired up, as evidenced by Mitt’s fundraising totals in the past 30 hours. The Romney campaign claims to have raised $4.6 million after Romney promised to repeal “Obamacare” even though the Affordable Care Act is patterned after a plan Romney put into effect as governor of Massachusetts. And money is moving from Macau to Main Street-U.S.A. Las Vegas-based casino mogul Sheldon Adelson has pledged $10 million to the Koch brothers. The oil billionaires are vowing to raise $395 million to support Romney and Republican candidates. The Democrats better prepare for a tidal wave of epic proportions this year. They shoved the ACA down Americans’ throats in 2010. Now they’re paying the price for telling the American people that their opinions didn’t matter. When the last votes are counted this November, President Obama, Reid, Pelosi, et al, will have wished that they’d listened instead of following their political ideology into political ruin. It couldn’t happen to a more deserving pack of tyrants. This morning, Democrats showed why they shouldn’t be trusted with anything anytime soon. During discussions on the ACA, most of which happened behind the locked doors of Nancy Pelosi’s, Harry Reid’s and Max Baucus’s doors, Democrats, including President Obama, insisted that the individual mandate wasn’t a tax. When they got to court, both in the 11th Circuit and in the Supreme Court, this administration argued that the mandate was a tax. A top surrogate for President Obama insisted Friday that the individual mandate in the Affordable Care Act was not a tax, despite the fact that the Supreme Court narrowly preserved the law on those grounds. First, calling people freeloaders because they don’t have the type of health insurance that the government is mandating is reprehensible. 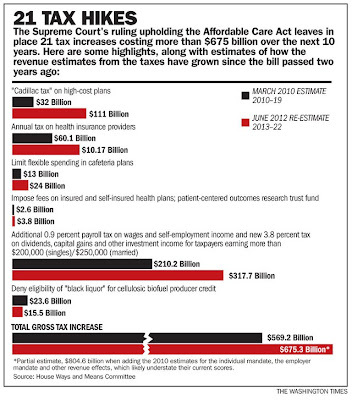 Second, it isn’t just “the other side” that’s “selling” the ACA as a major tax increase. 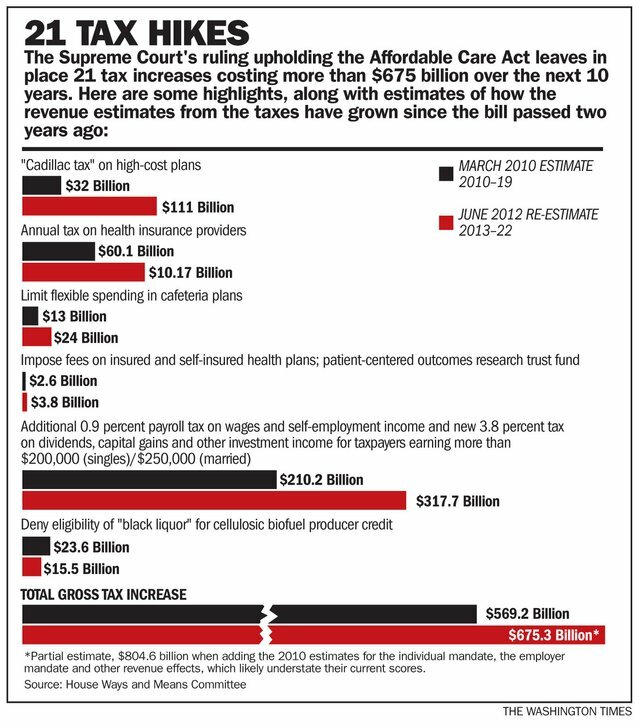 It’s the Supreme Court that’s saying it’s a major tax increase. Third, and most importantly, whether the mandate is a tax or not, the ACA has more than $675,000,000,000 worth of taxes in it. I wrote here that DFL lawmakers from Minnesota and Democrats from across the nation gave the American people “a 21-tax salute” when they passed the ACA. But Patrick said that it was about keeping people from getting care in expensive emergency room settings rather than private care settings. Further, he said that it would affect about one to two percent of Americans. “By whatever name, it’s a solution,” Patrick said, still insisting that it wasn’t a tax. How is a system that increases health care costs, that raises taxes on America’s middle class and that doesn’t appreciably shrink the number of uninsured “a solution”? That type of thinking isn’t stupid. It isn’t spin. It’s a bald-faced lie. That’s why Americans need to reject the Democrats this November. They’re disgustingly dishonest. They’re totally devoid of solutions that help the middle class. They’re utterly undeserving of positions of authority over anything. The longer President Obama and Mr. Holder refuse to comply with a federal subpoena, the longer the American people will see their behavior as disgusting. Congressional investigators issued a subpoena Wednesday for communications from several top Justice Department officials, including Attorney General Eric Holder, relating to the discredited “Fast and Furious” federal gunrunning operation. The subpoena, issued by the House Oversight and Government Reform Committee, also covers communications from Holder’s chief of staff, Gary Grindler, and from Lanny Breuer, head of the department’s criminal division. Had Mr. Holder complied with the congressional subpoena a month after it was issued, which was certainly possible, this wouldn’t have become an election year issue. Fast and Furious would’ve still been an issue this campaign. When an administration’s policies lead to the cold-blooded murder of a law enforcement officer, it will be an election issue. Thanks to Holder’s reprehensible behavior, the gunrunning operation and the DOJ’s behavior in hiding behind executive privilege, this will now be used as a billyclub against this corrupt, inept administration. Fast & Furious is going away. Unfortunately, we won’t put it behind us until after Romney defeats Obama this November. Would you vote for any weakening or repeal of collective bargaining laws for NH’s public employees? Would you vote for any legislation that would limit the ability of a union to collect dues through a payroll deduction? Would you vote for any measures that would block the implementation of the Affordable Health Care Act? Do you support any proposed constitutional amendments such as CACR6 which would prohibit any increase in a tax or fee without a supermajority of lawmakers (60 percent) approving it? Do you support and would vote to provide an annual COLA (Cost of Living Adjustment) for retirees of the NH Retirement System? Would you vote to retain the current structure of the NH Retirement System as a defined benefit program or a defined contribution (401-k type) plan? Do you support so-called “voter-id” legislation that would create additional requirements for voting in NH? If elected, would you become a member of the American Legislative Exchange Council (ALEC)? Do you support diverting funds to charter schools? Would you vote for school vouchers? There are 25 questions in the questionnaire. I just picked out the 11 most offensive questions. It isn’t surprising that AFT-NH would include questions about charter schools and vouchers. It’s offensive, though, that they’d ask whether legislators would “divert funds to charter schools.” The elected officials that represent the people have the authority to do what the people want. If they decide that funding charter schools will improve educational outcomes, then that’s what they should do. Wording it that funding charter schools is diverting money from union schools is offensive. I could argue that union schools are diverting money from higher quality schools. It’s painfully obvious that AFT-NH will fight hard to retain their defined benefits retirement plans. Potentially, that’s a fight of epic proportions between the NH legislature and AFT-NH. The fight for automatic COLAs will potentially be a fight of epic proportions, too. If NH is like most states, their PEU pension plans are badly underfunded. Within a decade, they’ll have to take money from the state’s general fund to meet their defined benefit plan obligations. That most likely means raising taxes so that other budgets don’t get cut. What’s puzzling is why AFT-NH is interested in a politician’s views on Photo ID. This questionnaire unquestionably looks out for the union’s rank-and-file. Still, it tells us that AFT-NH’s goals aren’t society’s goals. That’s why their agenda isn’t likely to get passed. The Obama administration’s hatred for the Second Amendment has reached new heights. After nearly a decade of safe operation, the White House is looking to reduce the number of pilots who provide an extra layer of security against airborne terror by packing a pistol in the cockpit. This plan shouldn’t fly. The federal flight-deck officer program was put in place as a direct response to the attacks of Sept. 11, 2001, when terrorists barged into the cockpits and seized control of airliners. The initiative provides $25.5 million for weapons training for pilots, including for cargo carriers and private charters. President Obama’s budget would slash the amount in half. Uncle Sam spends about $4,800 per pilot for the training administered by the Transportation Security Administration (TSA), but aside from that, it doesn’t suffer from the usual bureaucratic bloat. Participants must pay their own travel, lodging and meal expenses. About 10,000 pilots have been certified, but the Obama administration’s goal is to see the number of armed aviators dwindle. With all due respect, they don’t know better. If this decision is a matter of who’s best equipped to make this decision, then it should be Chip Cravaack, not a pair of ideologues who don’t have the first clue about this program. This fits the pattern. President Obama’s ego won’t let him admit that he should listen to the experts. Secretary Napolitano’s incompetence won’t let her admit that she should let experts make the important decisions. The reality is that this administration, especially Secretary Napolitano’s part of it, is exceptionally incompetent. When this administration’s epitaph is written, the word incompetent will have a prominent place in that epitaph.